Have you ever spotted a logo only to know immediately which brand it belongs to? Maybe Tiffany blue rings a bell? Or, perhaps, the sight of a castle before the opening scene of a movie makes it that much more magical. These little moments are part of a bigger story—a brand story. As a business owner, you want your audience to be able to recognize you in a crowd. You want to stand out from the rest. The only way to achieve this is through using a brand story in everything you create, including every blog post, every website page and every email newsletter. It’s easier than it sounds. All you need is a little bit of understanding and an easy-to-follow guide to help you structure each piece of content you create. Let’s get started. First and foremost, you must understand what your unique brand story is. A traditional story would have a beginning and an end. Your brand story, however, is the living, breathing backbone in your business. It supports each action you make, each piece of content you create and each service you provide. What is my business in the present? What was my business in the past? In regard to your content, these questions help you better understand the who, what, why, and how of your words and how they affect your audience. Who should this be speaking to? What should this content show them? How will this content make a difference? We know, grasping your brand story doesn’t necessarily make the process of content creation any easier. After all, creating content can take a lot of time, not to mention the added brain power it requires. But it is absolutely necessary to create content that is synonymous with your brand, a joy to read and a pleasure to share with others. 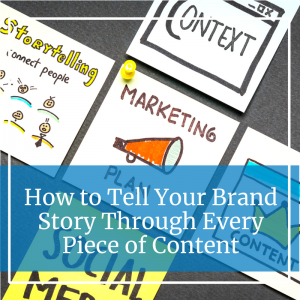 You can accomplish the feat of telling your brand story through each piece of content in three easy steps. We spend a lot of time talking about personas because they are critical to your brand. Without understanding who you are trying to reach with your story, how can you possibly target those who need and want you the most? When you create your content, always keep your audience’s persona in mind. Who are they? What problems do they have that you can solve? What type of content do they enjoy reading? Although it’s easy to forget, you are writing content for your audience, not your business. So, make it all about them from start to finish. Each brand has a unique personality that brings something extra to the table. For example, there’s Nike, a sports company that is well-known for their swoosh symbol. However, there is more to it than that. Their slogan, “Just Do It”, speaks to their conqueror personality and their audience who are focused on winning the game. Pixar is known for their adorable lamp who seemingly comes to life right before your eyes. Their personality of being extraordinary, taking the ordinary and transforming it, speaks to their level of animation and creativity that we all know and love. Your business personality, whether it be conquering, transforming, entertaining or motivating should be a factor in all of your content. When you’re writing, always look through this lens: what will my audience feel and experience as they read this? Will they experience the big win, or a sense of inspiration to do what no one has done before? This is the driving force behind your connection with your audience. Whether you are creating social media graphics or redesigning your website, it is important that you reference your brand’s style guide. If you don’t have one, it is time to create one. A brand style guide is a selection of your fonts, color palette, formatting, logo and other elements you use to communicate your brand. A style guide keeps everything consistent while taking the guesswork out of the creative process. Always make sure each piece of content aligns with your style guide, from formatting to graphics selection. You want your content to fit seamlessly with the rest of your brand, so that no matter where it ends up, it always leads back to you. Need Help Telling Your Story? Reach Out to Us! At times, we all need a little bit of help understanding our story and how it works with our content efforts. If you are struggling with consistency, we are here to help. Reach out to our team at Custom Content Solutions today by giving us a quick call at 612-643-1824 or by connecting with us online.